You'll discover tucked-away gems like Castello di Amorosa and Muir Woods National Monument. Escape the urban bustle at Alcatraz Island and San Francisco Bay. Explore San Francisco's surroundings by going to St. Helena (Pride Mountain Vineyards, Anderson's Conn Valley Vineyards, & more), San Gregorio State Beach (in San Gregorio) and Fitzgerald J V Marine Reserve (in Moss Beach). And it doesn't end there: get to know the fascinating history of Twin Peaks, take a stroll through Chinatown, take in the views from Golden Gate Bridge, and take a leisurely stroll along Fisherman's Wharf. To see where to stay, more things to do, and more tourist information, read our San Francisco holiday planner. Toronto, Canada to San Francisco is an approximately 13-hour flight. Due to the time zone difference, you'll gain 3 hours traveling from Toronto to San Francisco. Plan for little chillier temperatures traveling from Toronto in July, with highs in San Francisco at 26°C and lows at 16°C. On the 30th (Sun), wrap the sightseeing up by early afternoon so you can travel to Los Angeles. 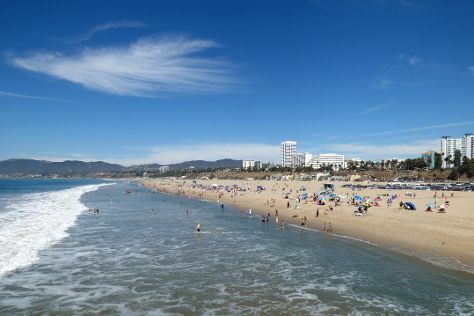 Step off the beaten path and head to Santa Monica Beach and Crystal Cove. Escape the urban bustle at Venice Beach and Boardwalk and Oxnard Beach Park. Explore Los Angeles' surroundings by going to Main Beach (in Laguna Beach), Malibu (Malibu Lagoon State Beach, Leo Carrillo State Park and Beach, & more) and Manhattan Beach (in Manhattan Beach). And it doesn't end there: contemplate the waterfront views at Santa Monica Bay, take a stroll through Angelino Heights Historic Area, admire the striking features of Walt Disney Concert Hall, and Head underground at Bronson Caves. To see traveler tips, photos, reviews, and tourist information, use the Los Angeles itinerary builder. Traveling by combination of flight and train from San Francisco to Los Angeles takes 4 hours. Alternatively, you can drive; or take a bus. Prepare for somewhat warmer weather when traveling from San Francisco in July: high temperatures in Los Angeles hover around 32°C and lows are around 20°C. You will have some time to spend on the 7th (Mon) before leaving for home.